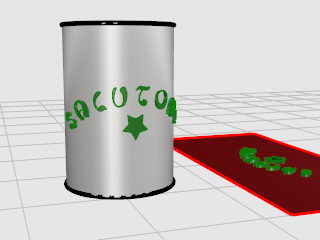 This tutorial demonstrates wrapping text solids and other objects on a cylinder. These objects could be used to trim holes in the cylinder. ● Create text as solid objects. ● Wrap the objects to a surface. 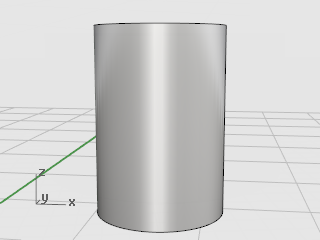 For this example, create a simple cylinder. Once you have learned the basic technique, you will be able to use other types of surfaces. Remember that trimmed surfaces maintain their basic rectangular shape. This underlying shape will affect the placement of the text. 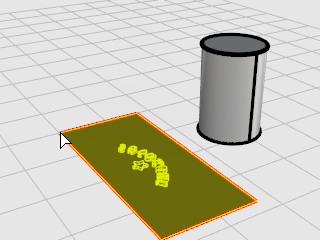 4 In the Perspective viewport, use the Cylinder command with the Vertical option to create a solid cylinder. 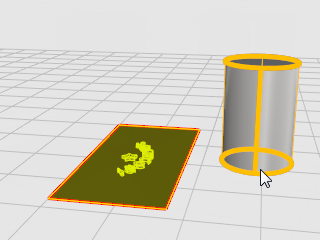 These solid objects will be wrapped on the cylinder surface. 1. Use the TextObject command to create your text using Solids. Choose a font that is fairly large and blocky rather than one with many holes and details. Set the Height at about 1.5 units. Set the Solid thickness to .1 units. 2. 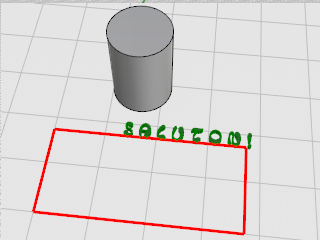 Place the text on the construction plane near the cylinder. The location is not important. The CreateUVCrv command generates the planar border curves of a surface that can be used as a guide to orient your text. Use the border rectangle to lay your text out before re-applying it to the cylinder. The rectangle then is used as a reference to guide the placement of the other objects. 1. Use the CreateUVCrv command on the cylinder side to create curves that represent the border of the surface on the construction plane. 2. Select the side of the cylinder. A rectangle is created starting at 0,0 on the Top construction plane. 4 Use Move, Rotate, and Scale or other transforms to arrange the text objects inside the rectangle just the way you want them to appear on the cylinder. Add any other decoration curves you want to use. 4 Use the PlanarSrf command to make the rectangle into a surface. 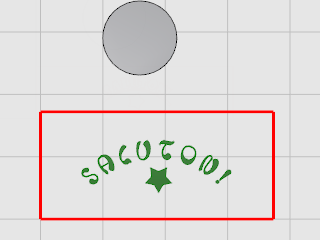 You will use this surface later as a reference object for the FlowAlongSrf command. 1. If you have created other curves, select these. 2. 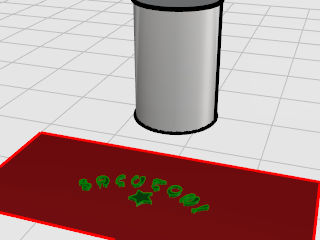 Use the ExtrudeCrv command to thicken the decorations to match the letters. 3. At the Extrusion Distance… prompt, set Solid=Yes. 4. At the Extrusion distance… prompt, type .1. 1. Select the lettering and the decoration. 2. Start the FlowAlongSrf command. 3. At the Base surface… prompt, set Rigid=No. 4. Click the rectangular plane near the "lower-left" corner as illustrated. 5. 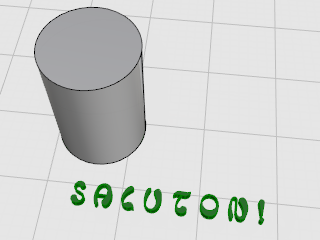 At the Target surface… prompt, click the cylinder near the lower edge of the seam as illustrated. The text and decoration solids wrap around the cylinder. Now you can use the letters to cut the cylinder or Boolean the objects together.